Immobilizer: The S2000 immobilizer is not supported. Water Temperature: The S2000 dash water temperature display functions as per normal. For an AP1 the second segment normally lights at 145 degrees F, and the third at 165 degrees F.
Air Conditioning: In KManager you will need to select 'Use alternate AC switch input'. No wiring changes need to be made. Idle up and enrichment is as per the stock ECU. Closed loop: The RSX ECU will run in closed loop using the S2000 primary oxygen sensor. Due to the RSX ECU normally using a wide band oxygen sensor, in KManager you use select 'Use Secondary Oxygen Sensor for Primary' (don't panic - the ECU is actually running off the S2000 primary oxygen sensor, which has been routed through the RSX ECU as the secondary oxygen sensor). Using a wideband RSX oxygen sensor is not recommended because the oxygen sensor is expensive (as much as an aftermarket wideband) and substantial re-wiring is required. The ECU can datalog aftermarket wideband controller which output a analog voltage (via the ELD input). Use only PRA ECU calibrations (PRA ECUs are the only ECUs which support a narrowband primary oxygen sensor). Select 'Use alternate AC switch input'. Select 'Use Secondary Oxygen Sensor for Primary'. OBDII Scan tools. OBDII scan tools work normally, and is smog compatible. Note that the S2000 K-Pro is not smog legal, and for off road use only. 2006-2009 S2000. The RSX ECU is not compatible with the 06-09 drive by wire, so the S2000 K-Pro cannot be used. 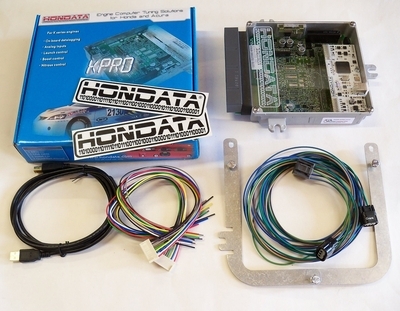 Please see the Hondata FlashPro for 06-09 S2000. ECU Mounting: The new ECU is the approximate size and shape of the S2000 ECU, and is located with the same orientation as the S2000 ECU, however it does not have the mounting holes in the same location. A mounting bracket is supplied with this ECU package to mount the ECU in the stock location. All HA Motorsports ECU circuit boards are socketed and modified using quality components, then thoroughly tested on our state-of-the-art testing equipment to ensure complete quality control. ECU casing is completely restored to like new condition using our glass bead blasting process. 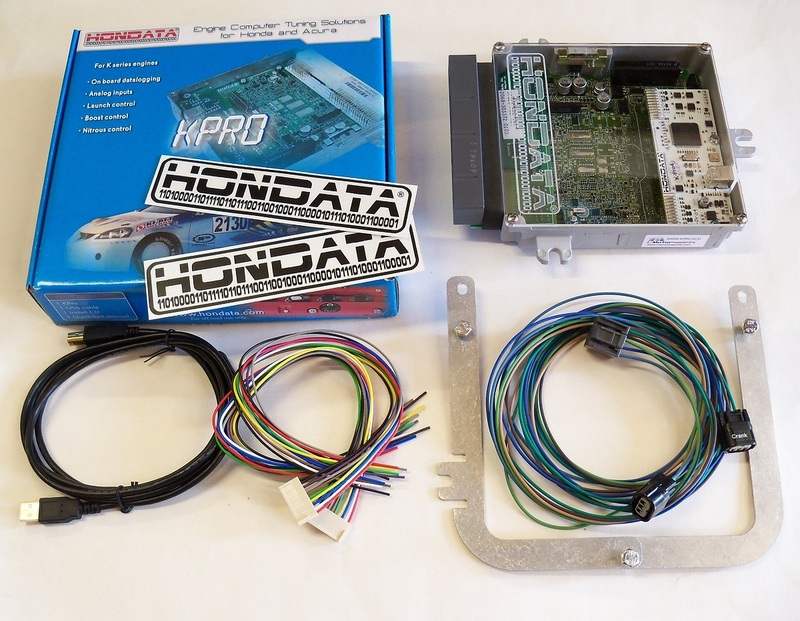 The K series ECU lid is replaced with a clear plexiglass lid with etched Hondata logo, then finished off with a new set of stainless steel screws. All HA Motorsports ECU's, products, and services are guaranteed for 90 days from purchase to allow our customers plenty of time to install and use their item(s) to make sure they perform correctly. - If you are an international customer and would like to order Hondata products, please see the Hondata dealer list to locate an international dealer.